Continental Contact, 26" x 1.75"
Update! 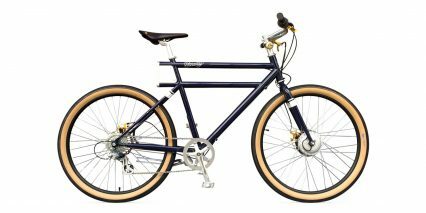 The Faraday Porteur and Cortland moved from $3,799 to $3,499 in 2017 and the review listing price here has been updated to reflect that. Faraday produces some of my favorite electric bikes because they’re well balanced, light weight and self-contained. 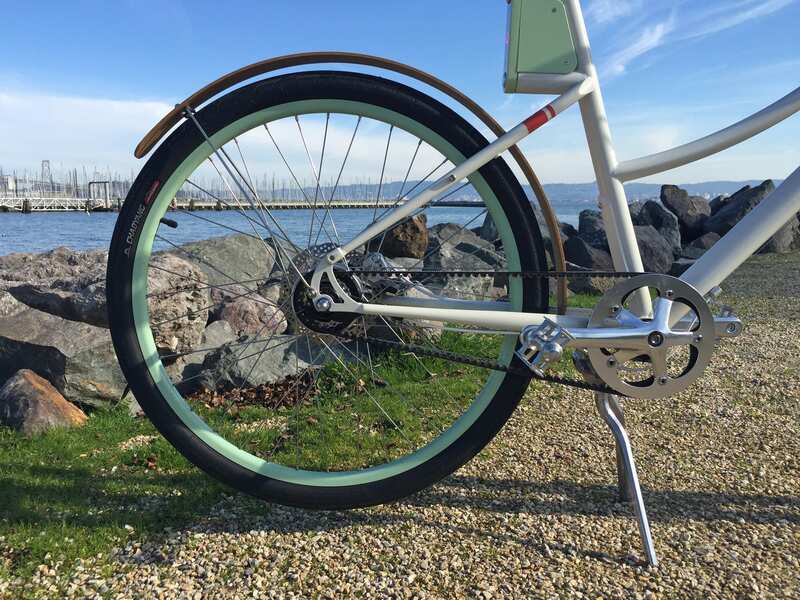 The battery stays in the downtube and hardly changes the look or ride quality of the bike. 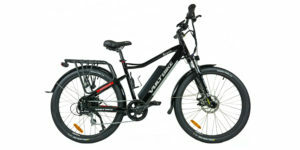 The motor is minimal but noticeable when activated, especially on high power mode or when climbing hills. 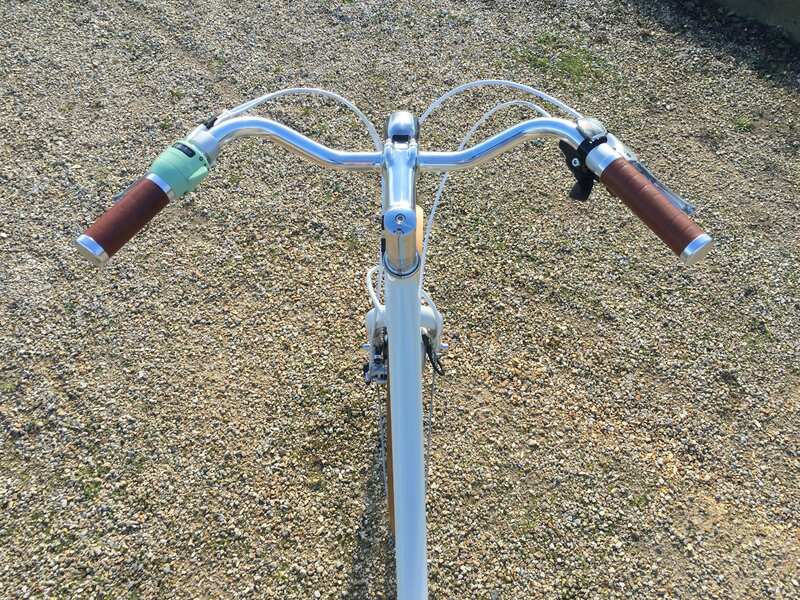 Frankly, even if their products weren’t electrified I would still appreciate the aesthetic and detail imbued into each model… classic colors, relaxed but comfortable handlebars handlebars and vintage pedals celebrate the rich history of this artistic tool. 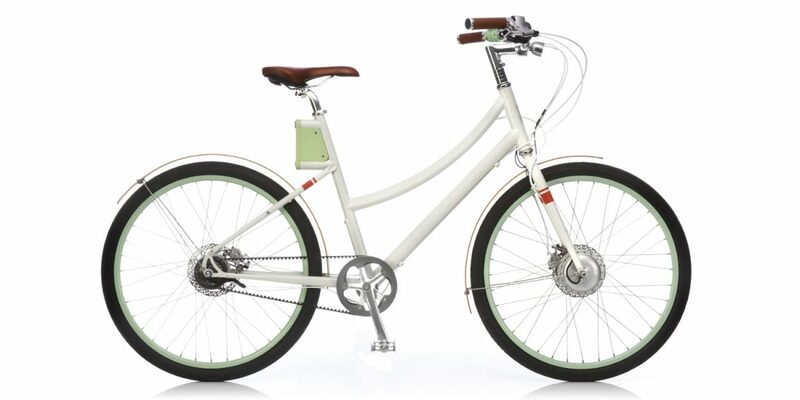 The bicycle exercises our body and mind by connecting us with nature and each other and for me, beautiful bicycles like the Cortland also exercise emotion because they inspire and attract. But you already feel it I’m sure, I guess I’m celebrating this aspect deeply because it comes at a higher price of nearly $4k. 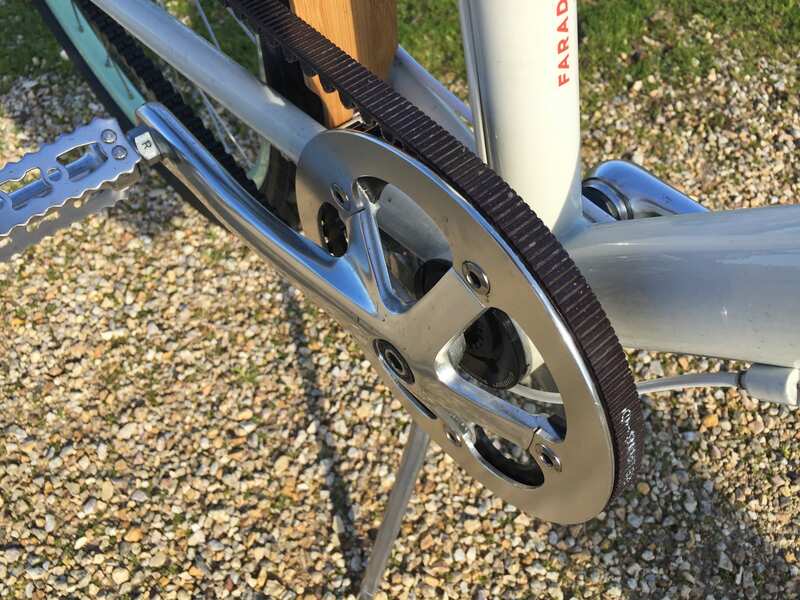 Faraday is a fun company but they do sweat the details and it really shows when you take a closer look. 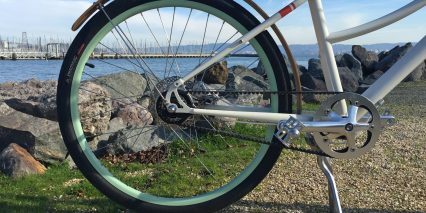 The Cortland is their first step-through model and this review focuses on the premium Cortland vs. the more affordable Cortland S (mirroring the Porteur S in component downgrades and price). 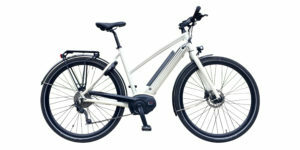 This ebike is loaded with upgrades including an internally geared eight speed Shimano Alfine hub that can be shifted at standstill (great for hill climbing), a quiet and clean belt drive system with center-track alignment technology, hydraulic disc brakes, leather touch points and bamboo accents as well as the integrated lights and mobile app compatibility that other new models get. 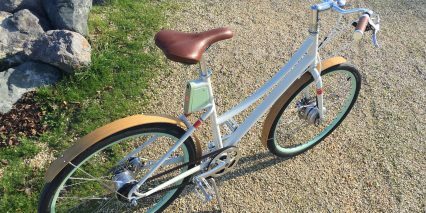 It’s quieter, cleaner and probably more reliable than the entry level S model but the internally geared hub adds a bit of weight and the bamboo fenders aren’t quiet as wide and protective as the curved steel alternative. 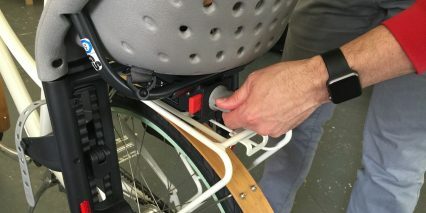 Depending on your needs, Faraday offers a whole line of accessories including a leather pouch that doubles as a u-lock holder, front and rear racks that are sturdy and compatible with Yepp! child seats and other accessories and even a GPS tracking unit for theft recovery. Everything is well thought out and most owners of existing models can upgrade parts independently to be included on the latest and greatest features. 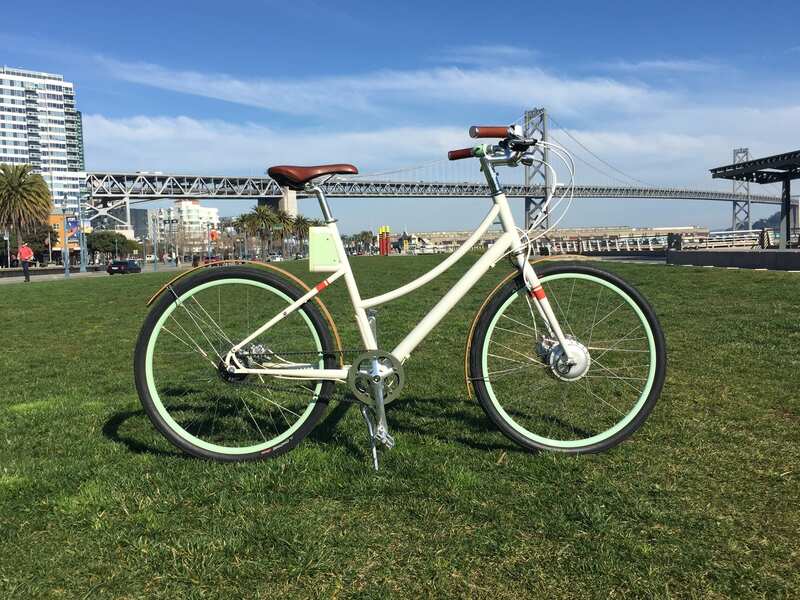 The Cortland model has been a long time coming and that’s partially because the company has been sourcing better parts, hiring staff and opening a headquarters location in San Francisco where cycling and technology are continuously progressing. 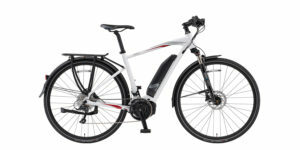 The new mobile app is a perfect example of this as it incorporates realtime range estimates based on battery charge level and power selection, drive model adjustment (more or less power) and even speed selection for those who appreciate a leisurely pace or want to take it beyond 20 mph as a speed pedelec (topping out around 28 mph). This is fantastic technology and while not entirely unique to Faraday it’s definitely leading edge and very well done. 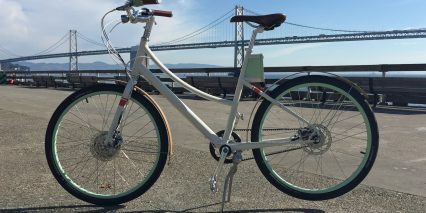 The bike isn’t perfect for everyone but thanks to the new low-step frame design it’s a lot more accessible. 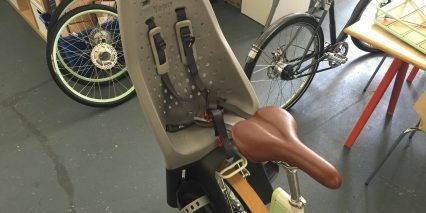 Available in two sizes and two colors, it’s perfect for petite riders and really anyone planning to carry a child along on the rear rack. 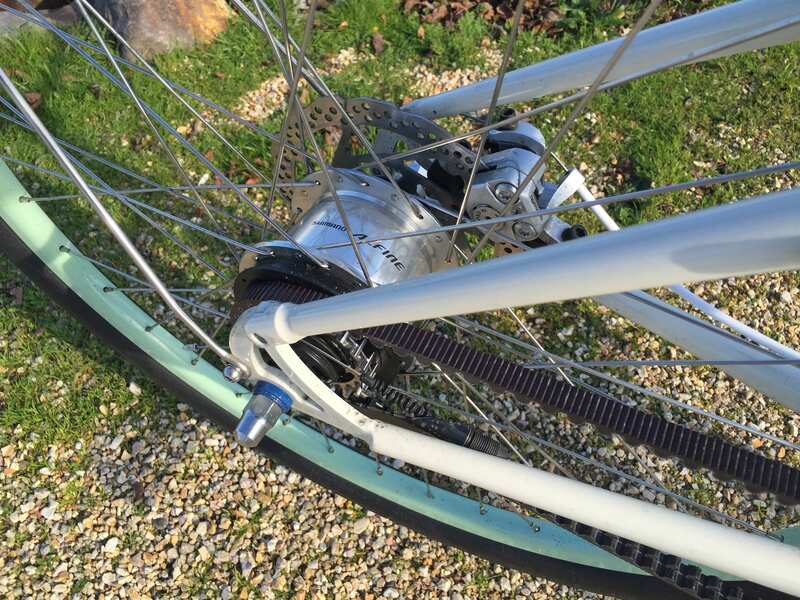 I found that mounting, standing over and holding the frame steady was easier than with the Porteur (as you’d expect) but was delighted to find that frame flex had not become an issue. 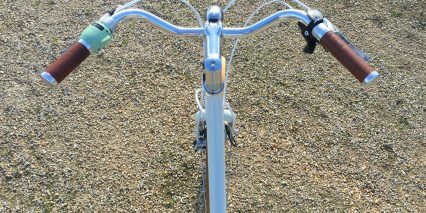 The ride was responsive but still comfortable thanks to the steel frame and larger diameter tires. I think the seating position and bars also play a role… it’s just way more comfy than it appears to me for some reason. 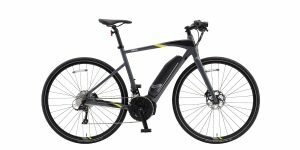 For those who are active and agile this is a near perfect electric bike, one that’s fun to pedal around even when off, one that can now go further with the addition of a unique battery upgrade and one that is balanced and steady while riding or holding. 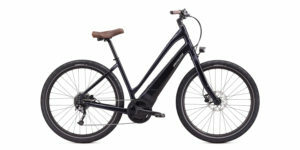 It’s extremely quiet even though it uses an internally geared hub motor and intuitive to operate. 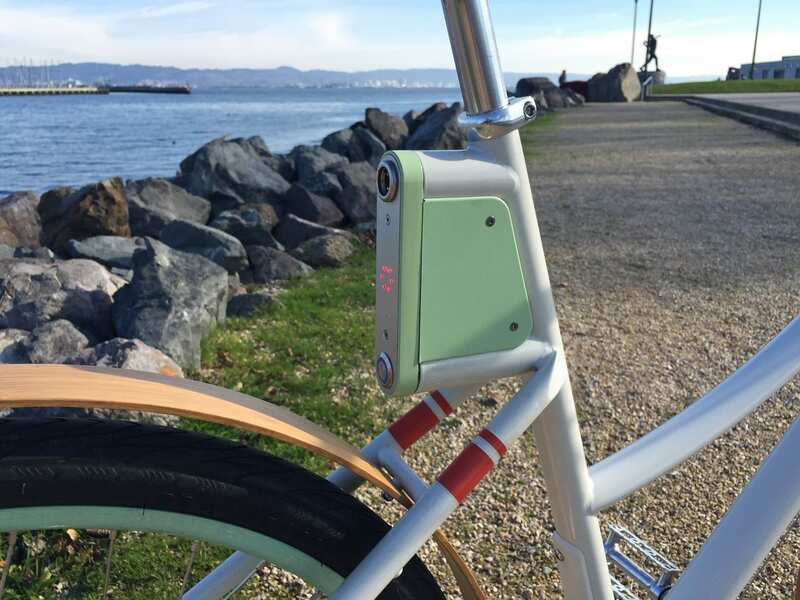 I never felt distracted by the display or power level switch and never felt uncomfortable or out of place among other cyclists and pedestrians. To me it represents the evolution of what many bicycles will become in the future as technology becomes smaller, lighter and less expensive… but it’s also beautiful. A really thorough video review, Court, and with the text portion as nicely written as the Cortland is to look at. Good job! 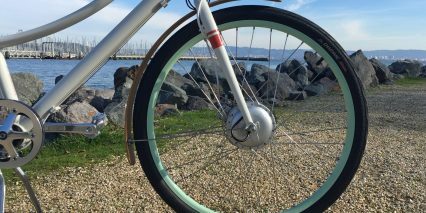 You didn’t comment – video or written – on the Cortland characteristic that stands out to me as most unique: that hub motor’s location on the front wheel. 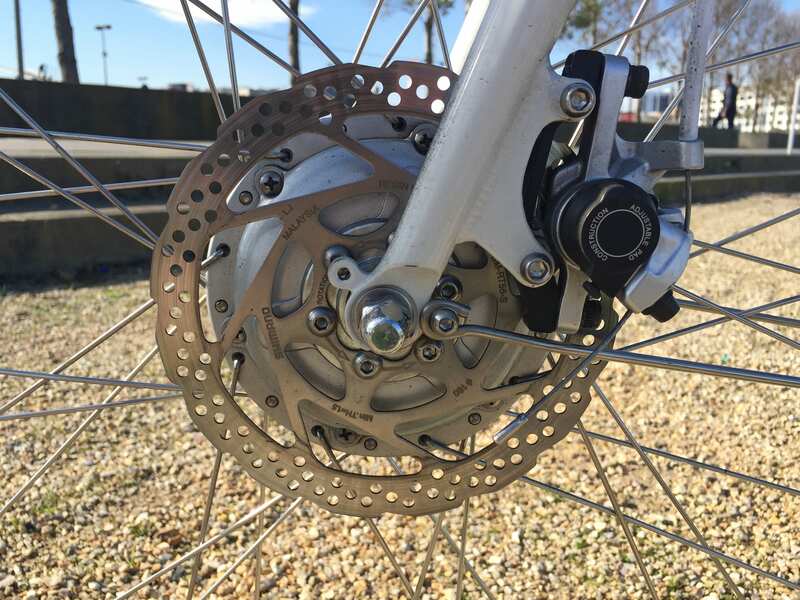 You’ll remember your discussion with Justin Lemire-Elmore last year wherein he claimed there was likely no difference in ride-ability between a front hub motor and one in the rear, all other things being equal. (You sounded a bit dubious about that claim, and that’s certainly how I reacted when hearing it). So what did you think? 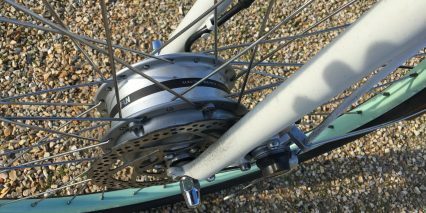 Altho’ the Cortland’s motor isn’t especially powerful or heavy, did you notice any distinct riding sensations attributable to that front hub motor? Presumably, the motor is up front because of that Alfine IGH in the back. No downsides? Thank you so much for your thorough reviews. You help a lot of people. 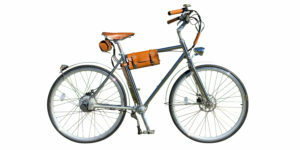 I think I will buy me a Faraday Cortland tomorrow ?. Hello Court, I am very interested in purchasing an ebike. I love your reviews and have learned so much from them. I am 65 with a little heart condition and live on a pretty steep hill. I would like to get back into biking for exercise but I know I can’t ride my Cannondale back up home. I am interested in the Courtland and Trek FX500. In your opinion, which would be better for climbing steep hills? Do you have any other recommendations? I presently am not a serious rider but live here in Sonoma county and there is a lot of nice country to ride/cruise around. Keep up the good work. Thanks Court for your response. It was very helpful. 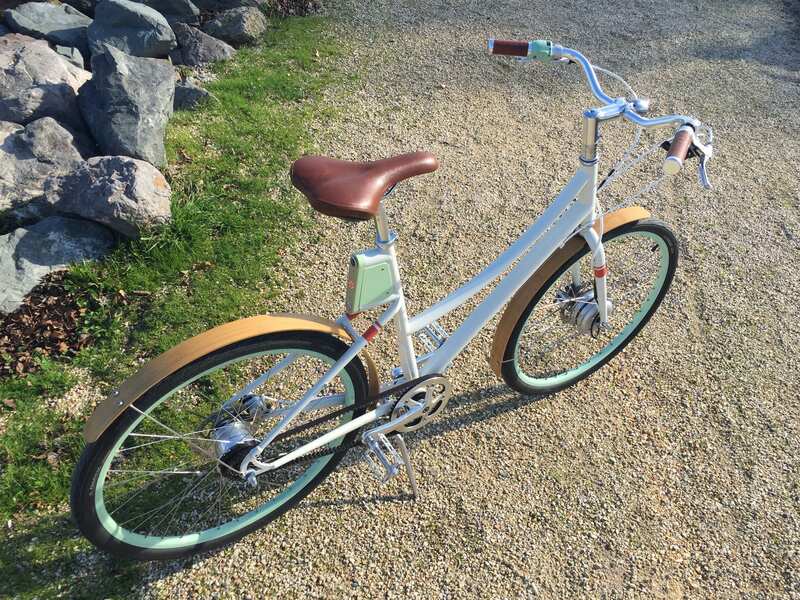 You were correct, I was thinking about the Trek XM700+….senior moment! 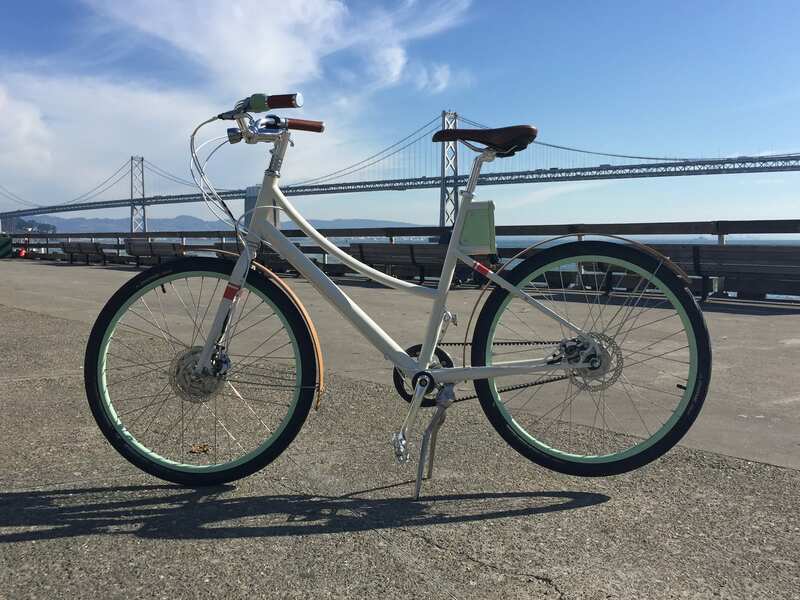 Might you know a bike shop in the Bay Area that might have an XM700+ available to see any ride? None of the Trek dealers in the north bay have one. I hate to order one sight-unseen and it not make it up our street. I just bought a Faraday last December and have used it every day since. 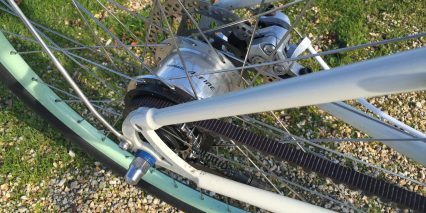 I notice that the Alfine 8 can have trouble shifting when the weather drops below 28 degrees (has trouble taking up cable slack). Studded tires eat into the range somewhat and the cold temperatures (expect 12-15 miles at 18-19 mph in 20 degree weather). I really like it though, so far there has been no maintenance (my old bike needed a check over every 200 miles). I originally didn’t like the front tire pulling design, but have found that on ice and in snow the front pulling action actually helps stability tremendously especially if you shift to lower gears and put it on max power. The weight is excellent and my wife can easily lift it and load it etc. We are considering getting another. 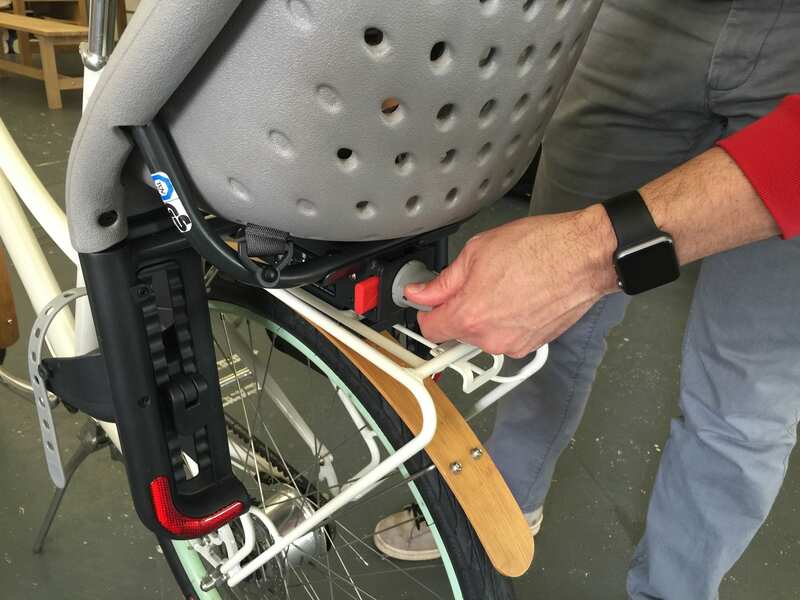 The front rack is really stable and large. Pretty easy to throw a regular size pizza box in it with just sticking out the front rack. It recharges very fast making the charger worth bringing. It’ll easily recharge about half the battery in under 20 minutes, it slows down and takes longer to top off. Great summary Don, I’m glad the bike is pleasing you and your wife… and that she can lift it! That seems to be a major hurdle for some and an area I personally dislike dealing with. 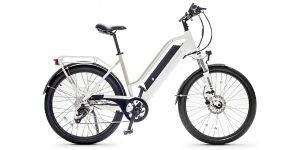 The range on these ebikes is more limited but with the quick charging and fairly compact charger it sounds like you’re doing great. Neat to hear how it performs for you in snow… hadn’t even thought of studded tires! Where’d you get them? Any tips on brand or size etc.? 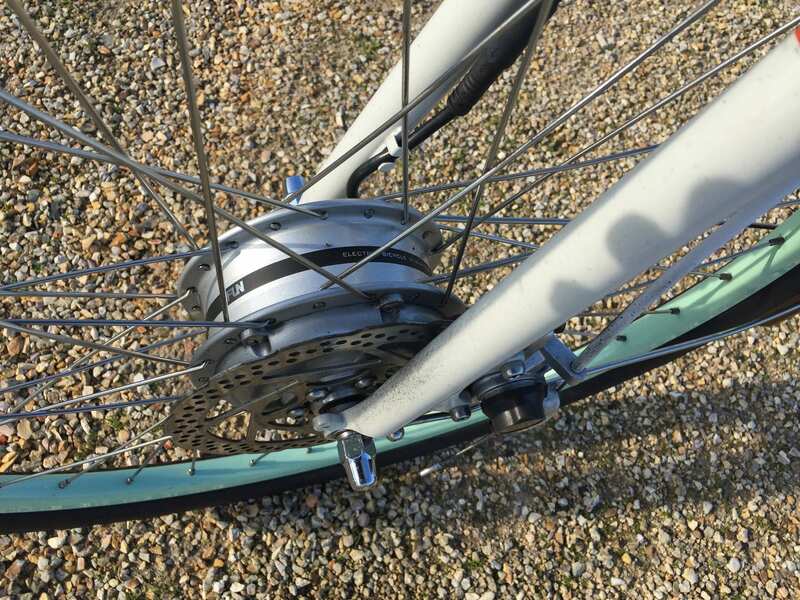 Also, great feedback about the internally geared Alfine 8 hub. 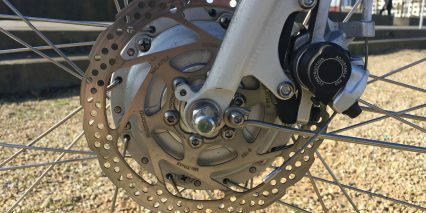 I have noticed some differences in how that behaves vs. a traditional derailleur, interesting that temperature has made a difference for you. Hi Court, I spoke with Faraday and they seemed to think the issue with the hub is with the tension and that if they are not totally tuned right they can become cold sensitive, so perhaps it is fixable. I think a realistic range of the bike is about 16 miles. I have about 3 miles of slight incline and 3 miles of decline followed by about 10 almost perfectly flat miles then the battery e-ink indicates empty. 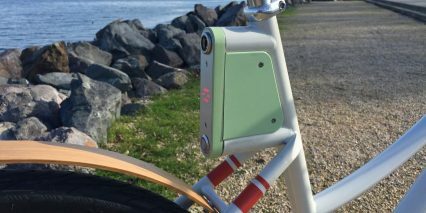 I am excited about the external battery they are going to release this summer-ish as I am thinking that would double the miles to a very realistic 36 miles. It is extremely well made and I’ll write another update when I put 2k+ miles on it. I have a Cortland and I get about 2 miles when it is cold. Unfortunately I am in NYC and must leave the bike locked up on the street overnight and the battery just does not hold the charge after a cold night and we are not even into dead winter yet. External Battery would be great but so far they have not moved on development. So I am pretty disappointed. At this point the big CON would be no removable or external battery. I agree great website and good reviews. 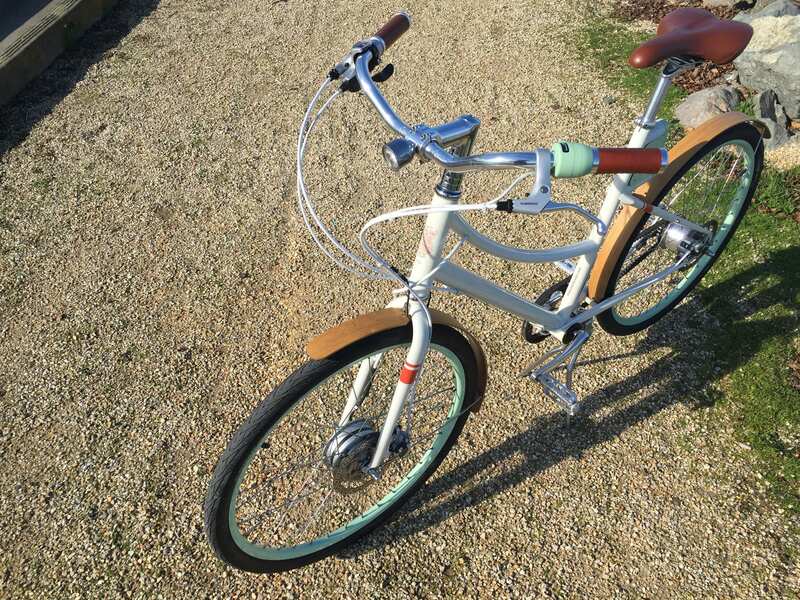 Thank You Court – I actually arrived at your website to read the Raleigh review (removable battery) and saw my Cortland in the side-bar. I do prefer the front wheel drive. I’m currently trying to figure some battery tube wrap maybe with hand warmers but nothing lasts all night. Considering it only got down to 36 F – not really cold – I figure in the teens and twenties this bicycle could be DOA (at least until I get to the office.) Shame, because I was looking forward to see how she handled the snow and slush. 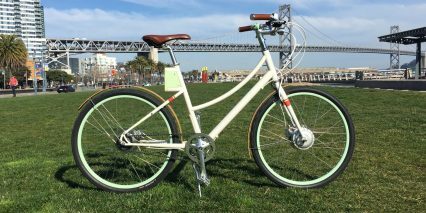 I’ve been thinking about purchasing the Faraday Cortland for a couple of seasons, and I think now is a good time as I’m looking for a nice step-thru frame with pedal-assist that doesn’t scream “E-Bike!” I test rode a Cortland recently but didn’t think it seemed very powerful. In reading your review, you mention the app that allows speeds of up to 28 mph. I’ve looked on-line as well as the App Store for iOS phones but couldn’t locate the app. I also reviewed Faraday’s website for information on the App with no success. Could you please direct me to where I can download the App? 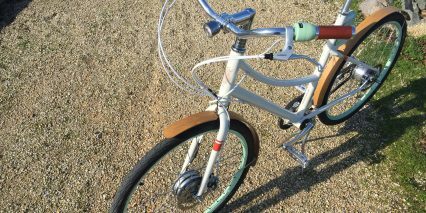 Additionally, I understand that Derby Bikes has acquired Faraday Bicycles. 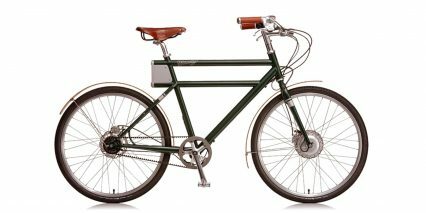 Do you have any thought about what effect that aquisition will have on Faraday bikes like the Cortland? 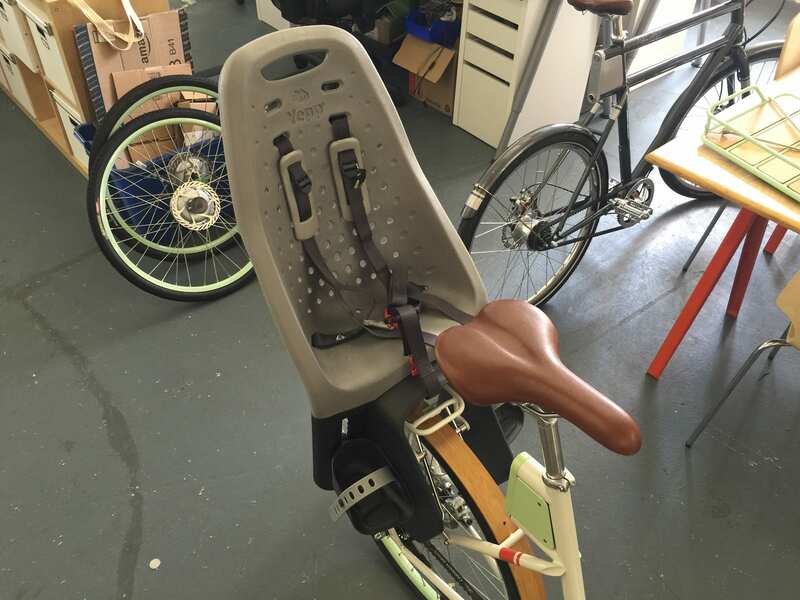 And, for example, might this mean that Faraday bikes will be using higher components in the future? 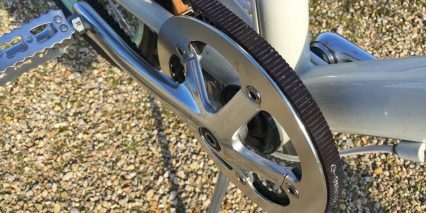 Personally, I found their shifters and on-off mechanism to be quite cheap for such a nice-looking bike. Thanks so much for helpful information! 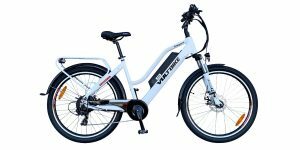 Do the Faraday bikes have regenerative braking so the battery is charging while you coast going downhill? Hi, thank you for the great review. 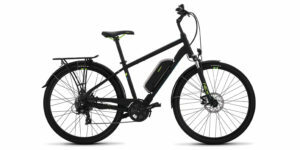 I am currently in the market for an electric assist bike and love the Faraday – the only problem being I live in Canada and would have to deal with customs etc to get a bike over here – plus the currency difference which will make this bike even more expensive for me – but it looks and sounds wonderful. 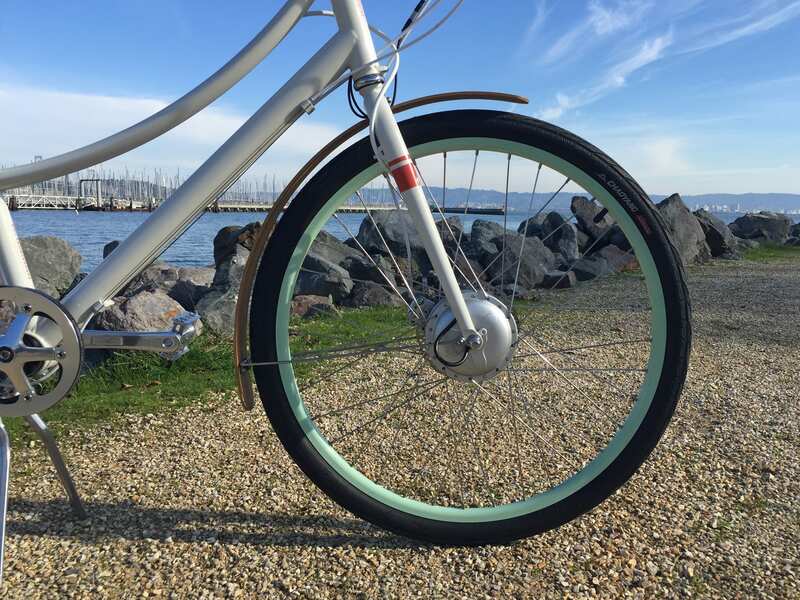 I was wondering what your thoughts were about the Electra Commute Go – I’m also thinking of that as a bike for me. Do you have a preference? Hi Court, I am very much interested in purchasing an ebike. 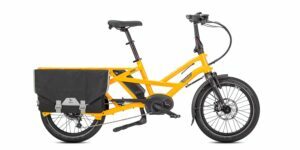 Your reviews on the ebikes are very informative. 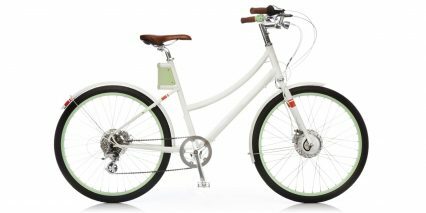 I’m almost 60 and would like to get an ebike for a weekend of fun biking along the beach and hilly vineyards in southern California. I need a bike that could jump start at a standstill to a pretty steep hill with minor effort. 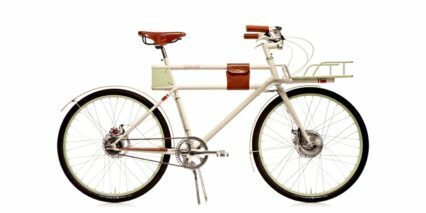 I was considering a TREK Verve + until I saw Faraday Cortland. Now I’m not sure what to purchase. Any thoughts or any other recommendations?